September 24th, Sina went to Yu Nan to visit team of Li Mi's Encounters and got exclusive Jue's pictures. In the afternoon, Zhou Xun played one of the most important scenes, Li Mi meets by chance her boyfriend (played by Deng chao) after 4 years separated but he doesn't know her and even hand in hand with other women. Because of the high requirement of performance and the atmosphere at the place of shooting was so noisy, Zhou Xun couldn't control her mood. During the afternoon, her eyes were full of tears. And perhaps because of being attentive to the crowd, after a NG, she shouted in front of the reporters. However, she quickly calmed down and apologized to them. 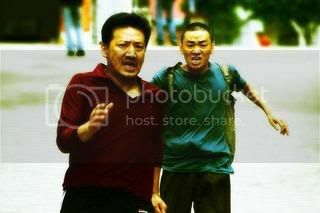 It was very dangerous as the scene was taken in the high brigde, the lord of dealing drug (played by Wang bao Gang) pursues Li Mi by car. 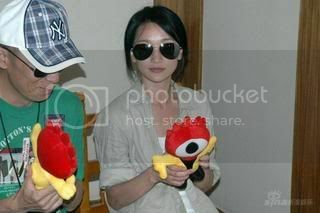 This required the extremme carefulness and absolute accuracy, other wise the car and Zhou Xun might fall down the river. After getting nesessary attentions from the director Cao Bao Bing, Zhou Xun did by herself without any protection facilitiy. Seeing this, reporters broke into perspiration for her. It was said that such dangerous scene appeared many times in the movie, Zhou Xun played by herself with no complain and even gave the staffs dust-proof kerchiefs to proctect from sunshine. On the same day, Zhou Xun and Deng Chao had an interview with Sina. Talking about the first cooperation with Zhou Xun, Deng Chao said that he leans many things from her. She always works so absorbedly that he cannot distinguish between Li Mi and her.